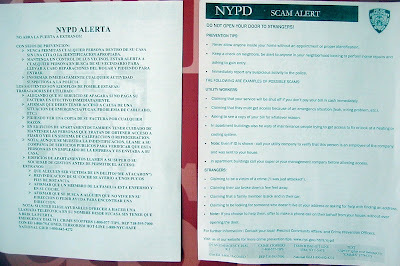 Focused on scams that involve opening your door to someone you don't know, the NYPD has signs around the neighborhood warning residents (in English and Spanish) about scams and advising them about how to avoid them. * Never allow anyone inside without an appointment or proper ID; even if ID is shown, call your utility company to verify. * Keep a check on neighbors, be alert to anyone looking to perform home repairs and asking for entry. * Immediately report any suspicious activity to the police. This can be a 911 call, based on what we were told at a June Community Council meeting. Imposter: Utility Worker Scam - claiming there is an emergency, claiming you must give cash or service will be shut off, asking to see a bill. Stranger Scam: Claiming to be a victim of a crime (call 911 for them, and say so), claiming his car broke down "up the block," claiming a sick family member is in the car, claiming to be looking for someone at your address and needing help with a new address.